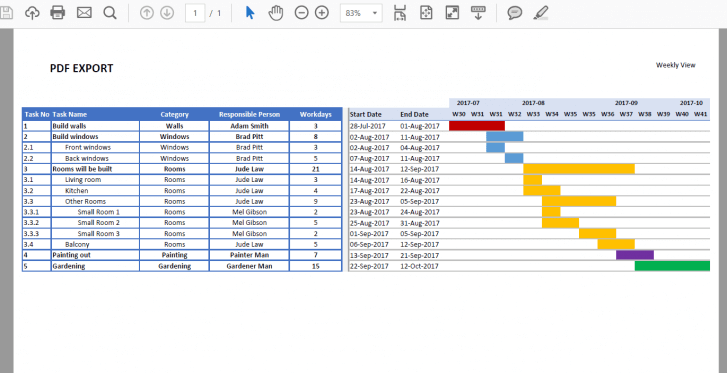 Excel Gantt Chart Template - Easily Create Your Gantt Chart! Excel Gantt Chart Template lets you create your Gantt chart with just a button click! Works on Windows and Mac. 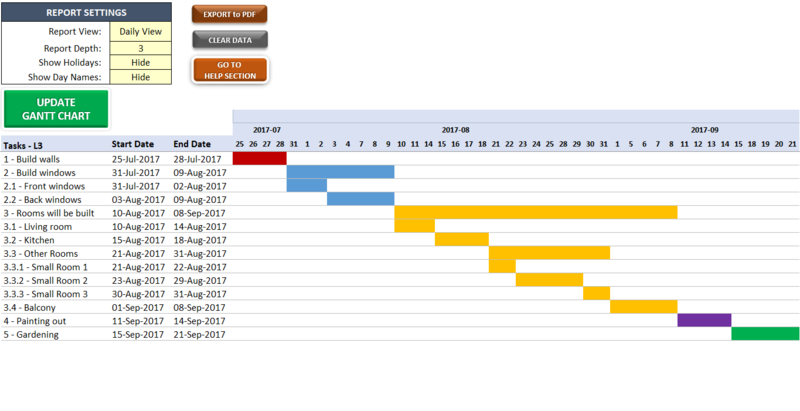 Gantt charts are one of the most popular project management tools in business life. 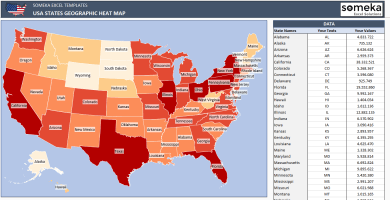 Even though this methodology is almost older than a century, they are still widely used today. 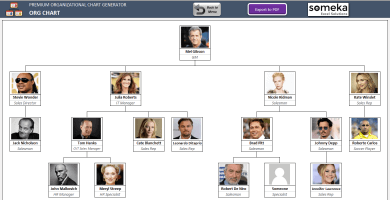 For this reason there are lots of Gantt chart software options on the market nowadays. 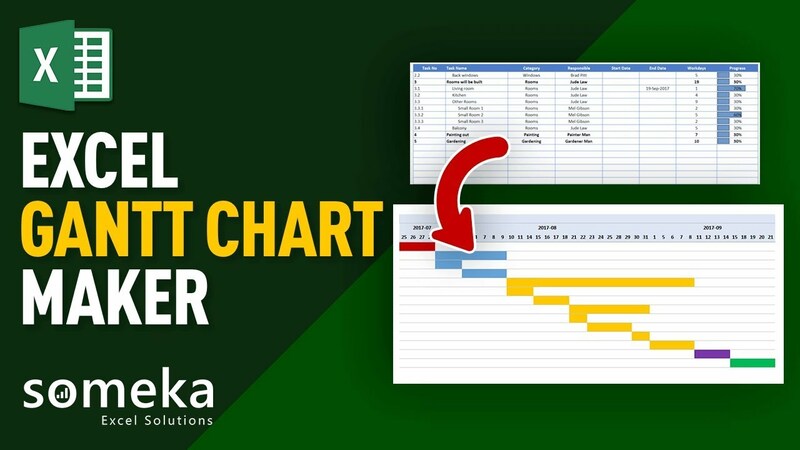 Why should you choose the Someka Excel Gantt Chart Template? No new software, no installation, nothing to learn. 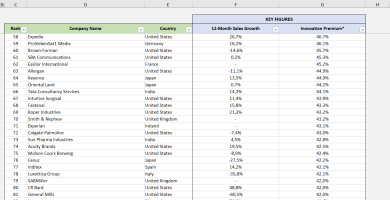 Everything in Excel. 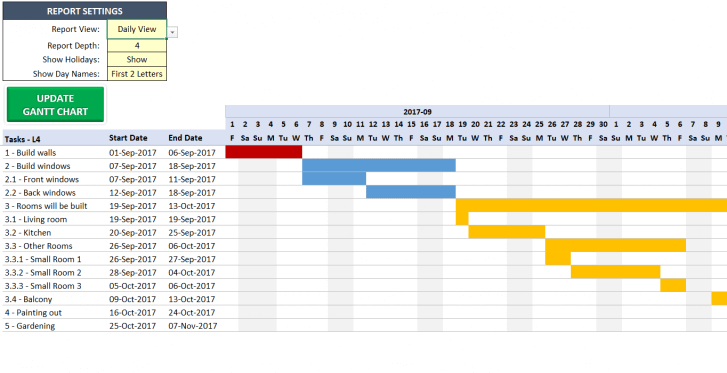 Just open this Excel Gantt Chart Template and start building your project’s Gantt chart! 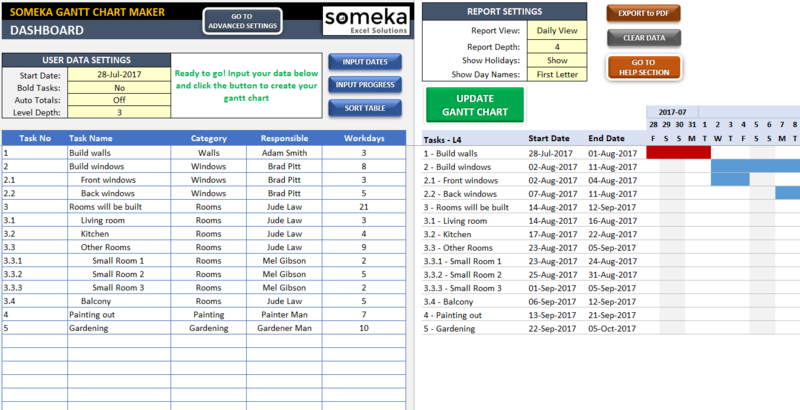 Someka Excel Gantt Chart Template is quite user friendly and easy to use. At the same time, it has powerful features in the background, which lets the user to do lots of different things if needed. 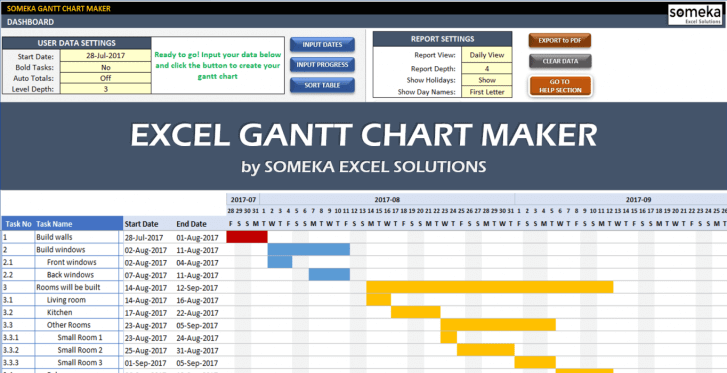 Let’s check what can you do with this Gantt Chart Maker. 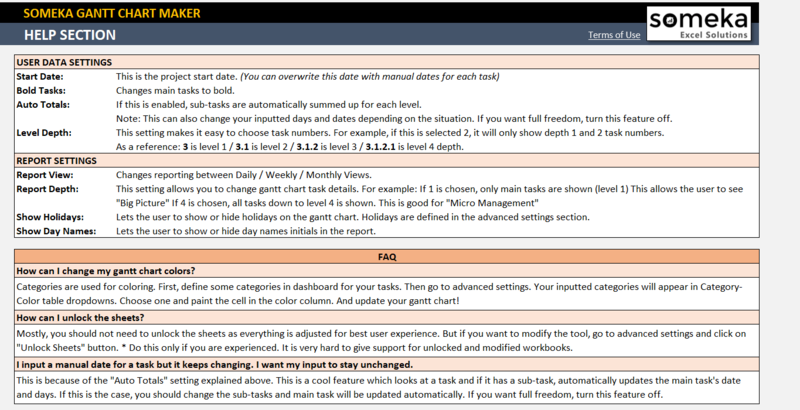 Easy to input Tasks/Sub-Tasks: This is one of the most challenging issues in project management. In our Gantt Chart template, we’ve used a well-known method called WBS (Work Breakdown Structure) You can either choose from dropdowns, write them manually or simply copy and paste from an existing spreadsheet. 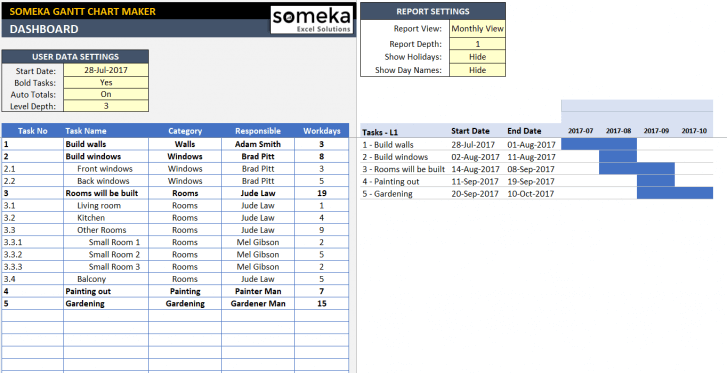 Easy Sorting: You have already created your tasks but later on you notice that you have to add a subtask to an existing task. 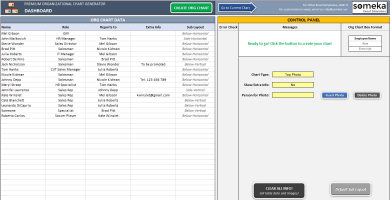 You don’t need to deal with deleting/inserting rows. You are free to input the tasks in any order you like. 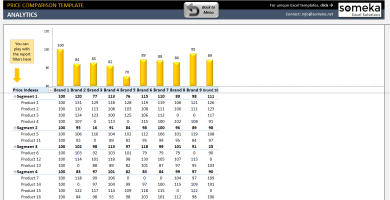 Just click the “Sort Table” button and it will automatically sort your tasks according to the WBS numbers. 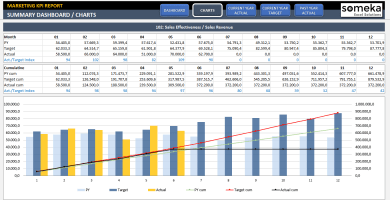 Auto Sub-Totals: Sometimes we create many sub-tasks and want the duration of the main task to be calculated automatically by summing up its subs. This feature handles all the hassle. And it is optional. 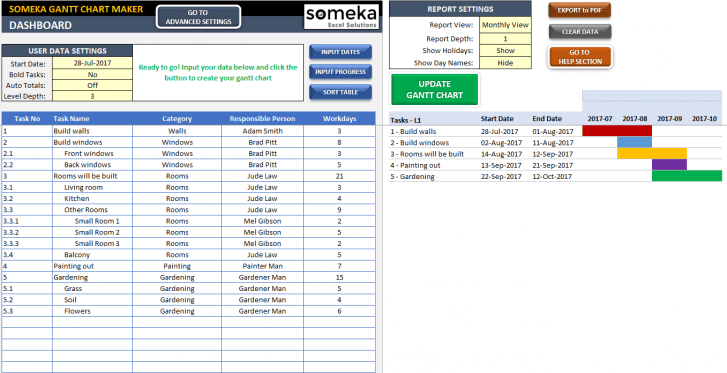 You can turn it off and create your Gantt chart with full freedom. Categories and Automatic Coloring: You can use categories in both grouping your tasks and painting them. If you wish, you can define different colors for each of your categories and have them painted automatically in the Gantt chart. Duration Days and Force Start-End Dates: In the simplest way, you can use the tool by inputting days for each task. 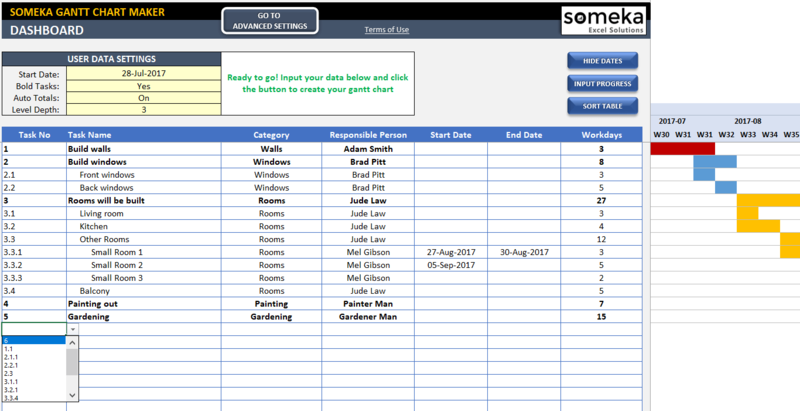 But if you want some specific tasks to start or end on certain dates, the tool also allows the user to input manual start/end dates. If any manual date is inputted, background calculations follow this information. Bold Tasks and Indent Sub-Tasks: You have lots of main tasks and sub-tasks, and want to make the main tasks bold for easier reading? 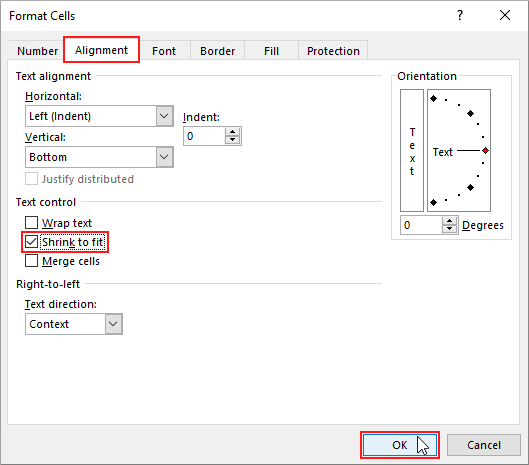 You don’t need to deal with formatting, this feature does it automatically. It also indents the subtasks according to the WBS numbers. Progress: This is an optional feature. If you want to see what percent completed any task is, you can use this column. 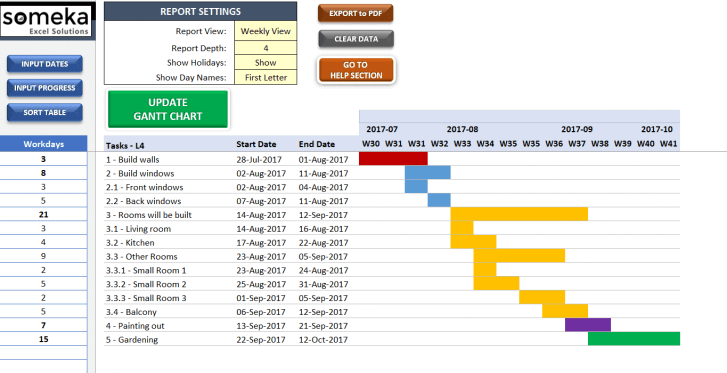 Report Depth Feature: This is quite cool for project managers. 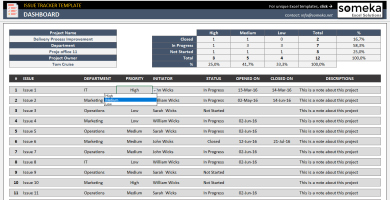 You can choose to see the report based on main tasks only. This lets you to see the “big picture” of the project. Or you can select to see the deepest details. This is handy for micro-management of sub-tasks. Holidays and Off-Days: Not every project stops at weekends. It all depends on your business nature and Someka Gantt Chart Template also lets you to customize this. You can choose which days of the week are off-days. Also you can define national holidays or other specific dates on which project will be on hold. 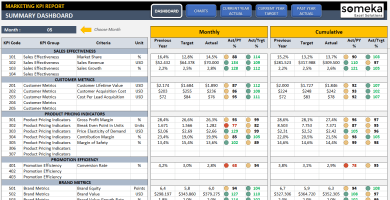 All calculations in the background will be made considering your inputs and selections. 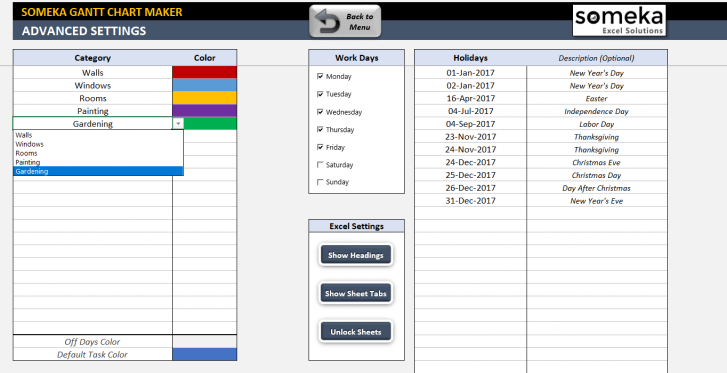 The template will skip holidays while calculating task durations to let you make the most correct project time planning. The best part is, all of these are available in Excel, the software you are already using everyday. As mentioned already, no need to install anything. Just open and start building your Gantt chart! Hi! I have bought your Gantt Chart Maker V5 but in day view it has to narrow Column so dates with two digits ends up with ### on every update??? Hello Melissa! Can you simply do this: Select dates column > Format Cells > Alignment tab > Checkbox “Shrink to Fit”. Just let us know if you still can’t get it! But when I put my own project which is only 23 rows, unfortunately, the file size became 30.000 kb. We have sent you an email with shrinked version for your specific case. Hope this helps! Thnk you so much the Someka experts. Everthing is ok but pls add more column!!! nice template which I can use with my Mac. 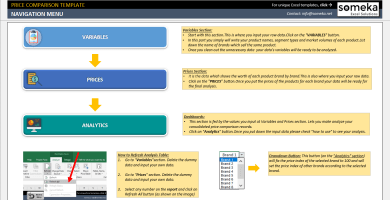 Since I can not use Microsoft Project on my Mac this was very helpful. Lifesaver for my job. Very easy to work with. Thanks Someka! You don’t have an Spanish version of the product!! Hi Yurena! 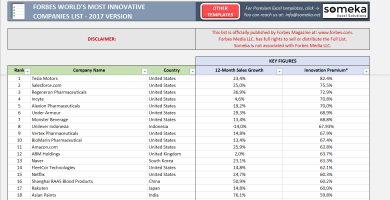 With the purchase you get the passwords and modification rights for the templates. So you can modify lines to add the Spanish descriptions! Simple and Effective template which I was looking for..Off course team is cooperative and efficient. Thanks. 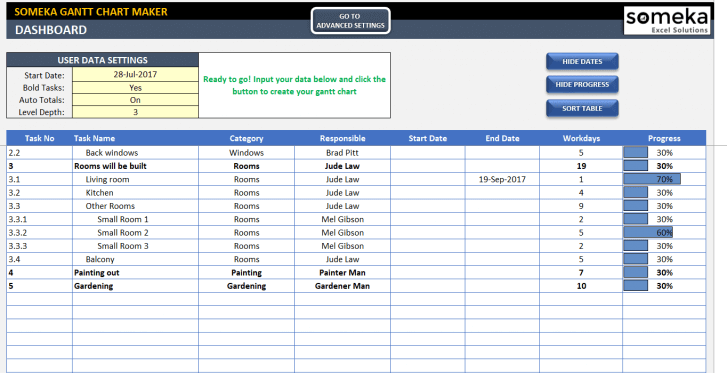 It could be a improvement to insert additional lines for the tasks, but company customized the template according to the way we needed it. Hello Steve! Thank you for your feedback! Technically, you can add lines easily by copy paste, but it would not be practical when you want to print it. So we are planning to add this new feature when you add lots of items in it and would like to print it to a second page! 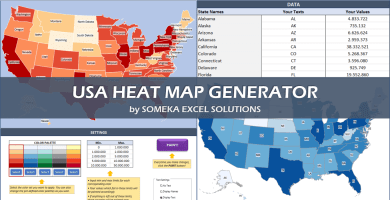 We will send the updated version to our current customers for free! Stay in touch! Exactly what I needed and super quick delivery! Great tool for a very good price. Highly recommended!